"Miniature wargaming is a form of wargaming which incorporates miniature figures, miniature armor and modeled terrain as the main components of play and which was first invented at the beginning of the 19th century in Prussia. Like other types of wargames, they can be generally considered to be a type of simulation game, generally about tactical combat, as opposed to computer and board wargames which have greater variety in scale." Warhammer 40,000 is a table-top miniature-based war game set in a dystopian future. Warhammer 40,000 was created by Rick Priestley in 1987 as the futuristic companion to Warhammer Fantasy Battle, sharing many game mechanics. Players can choose one of a number of factions from within the Warhammer 40,000 universe such as the Space Marines, the nearly extinct race of Elder, or the corrupted once-human forces of Chaos Although usually played by two players, theoretically any number of players can participate at once. 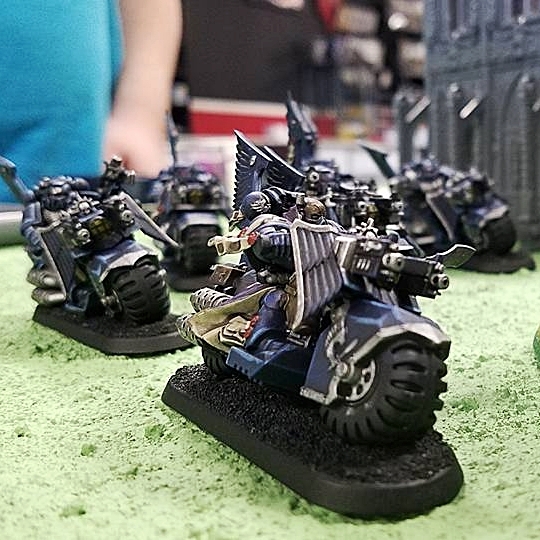 Warhammer: Age of Sigmar is a skirmish tabletop game for two or more players where you command several armies from a huge range that goes from Humans, Dwarves, High Elves, Undead Vampires, Orcs, Beastman, and lots of other races. Robotech RPG Tactics is a tactical miniatures game set in the Robotech universe. While the 1/285th scale game pieces can be used as a companion to the Robotech RPG, the game system is designed to be played as a tabletop miniatures game. Players build armies of multiple squadrons of mecha to fight it out in scenario-driven, objective-based game play. Take command of the fighting forces of the United Earth Defense Force (UEDF) valiantly defending Earth from alien annihilation – or lead the massive clone armies of the Zentraedi Armada to recover an alien artifact of immense power and enslave humankind. Depending on the faction, and their choice of mecha, a player's army may include anywhere from two game pieces to as many as you desire! The rules are scalable from small skirmishes to mass combat with hundreds per side.